I'm always interested in handspinner.co.uk, the newsletter run by Sheila Dixon that contains all the handspinning information that you'll ever need. She manages to find all the little interesting nuggets from the web to keep all us handspinners up to speed. This month was very interesting, being introduced to Liz from Dragonflylotus Handspun Thread, who spins handspun for embroidery. 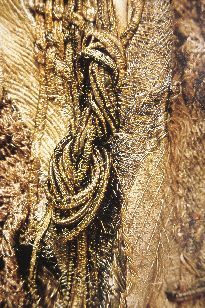 Ann's work used the most incredible yarns, and was the reason I wanted to create my own, so I'm really interested to see handspun used for embroidery It's good for us all to keep our options open too, as spinners and remember that our yarns can be used in many different ways. 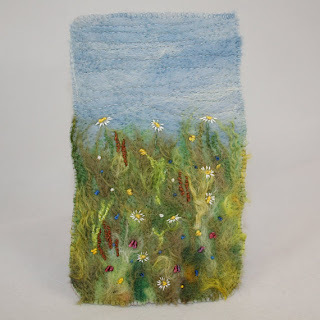 On the subject of using fibres in alternative ways, Sue Bentley from Lynwood Crafts on etsy is also a hand embroiderer and produces innovative and original wall hangings. This particular hanging, Daisy Meadow, uses these Lazykate Hand dyed fibres in the sky. take a look at her work on etsy, I'm sure you'll find it inspiring.